Looking for the best food carts in downtown Vancouver? 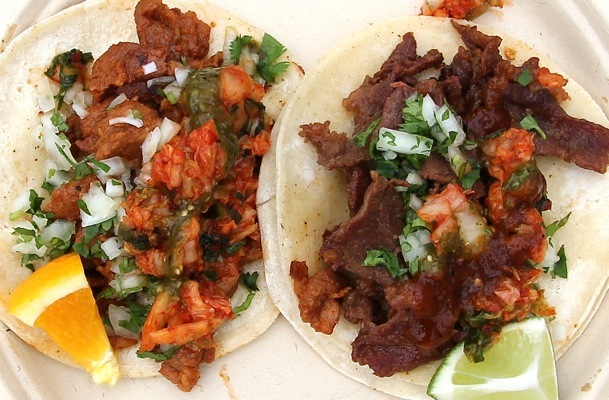 If you’re into Korean Mexican fusion, you’ll love this. They’re kind of like a power couple … plus one, minus the romance (unless we’re talking true love for a craft so honed), and throw in a food cart. Joel Watanabe and Jesse Grasso, the sensational chefs behind my favourite Chinese brasserie — Bao Bei — have teamed up with Abigail’s Party owner, James Iranzad, to open Cartel Taco, a Korean fusion food cart whose sweet little offerings have become the talk of the town. On their tiny menu live two items: A pork and a beef taco, both prepared in the Korean style of Bulgogi, which literally means ‘fire meat’. The locally sourced protein is marinated in a slew of secret sweet and salty ingredients, then barbecued right on the street, luring in hungry pedestrians with its wafting scent. Hand-made corn tortillas, the trio’s own salsa, kimchi and a sprinkling of fresh cilantro catapult this lunch into the ‘gourmet street food’ category. And for a price tag settled with the change possibly found in your pockets (one taco for $3, four for $10), you absolutely can’t go wrong.